Turkey and many parts of the Middle East and the Mediterranean were once under the rule of the Ottoman Empire. This empire had an immense influence in the architecture that would later define the character of the area, especially Turkey. We, as Ottoman architects were very influenced by the countries we conquered (Northern Africa, Central Asia, Italy, etc.). 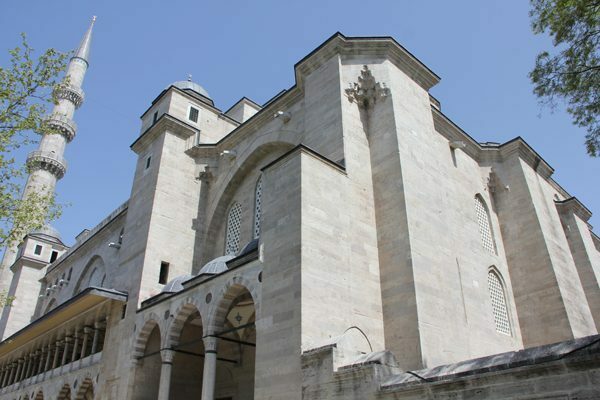 Ottoman architecture, also known as Turkish architecture, was highly influenced by the Byzantine architecture, Iranian, as well as Islamic Mamluk traditions. Whenever we conquered a place, we looked for the best artists and took them to our own capital, as slaves. It helped us develop our own visual culture through out the years. Oh, and I have to say that Italians were good architects and urban planners! 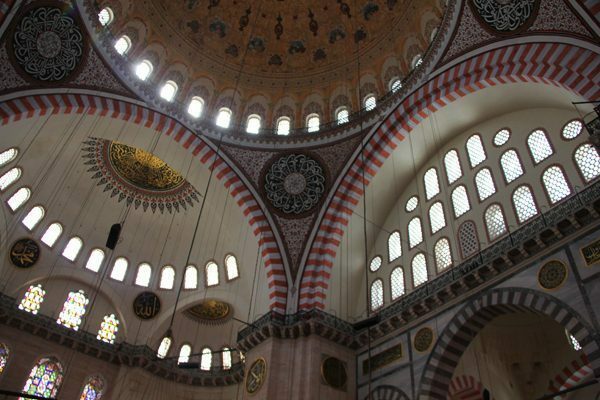 The Ottomans’ architectural vocabulary was simple yet dynamic; composed of vaults, domes, semi domes, and columns. The courtyard of the Blue Mosque, where you can see the basic elements of Ottoman Architecture. I would have built mosques as funerary monuments, not because people needed a space to pray in. The mosque is all about the commemoration of someone important. Speaking of funerary monuments… It was ideal to design the mausoleum (of the person commemorated) behind the prayer wall. The idea was that all your prayer (which face to Mecca) would go through the person buried there – and that person would benefit in the afterlife through those prayers. Mosques, are complexes, not just a simple mosque building. The mosque building is actually only one part of the complex, though the most important and monumental. Other buildings include dervish hostel, public bathhouse, a college, and in some cases, a kitchen for the poor and a hospital. It was an urban project. Representation of the sacred texts in artistic calligraphy. I would have followed a series of “sacred rules” when it came to mosque design, like: Pointing the prayer wall towards Mecca, no iconography (except for sacred texts from the Koran and floral patterns), and a centralized plan (we didn’t like the cross plan associated with Christian Basilicas). We liked to build our mosques in an austere manner. Ornaments were not as usual in our style, but a few mosques are very ornamental. 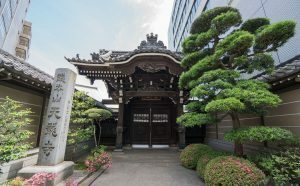 But usually, we reserve the ornaments to the main entrance and prayer wall. The typical exterior ornamentation in most mosques. Pretty austere. I would have hired expert calligraphers to decorate the important parts of the mosque. Calligraphy was a fine art, the equivalent of the paintings in the west. The purpose was to make them as artistic and ambiguous as possible and not readable. We Ottomans had a thing for flatter domes. It was easier to build, in terms of the weight, and we could cover larger spaces with them. Plus, they became the symbol of the city “rich life” in the Ottoman Empire. 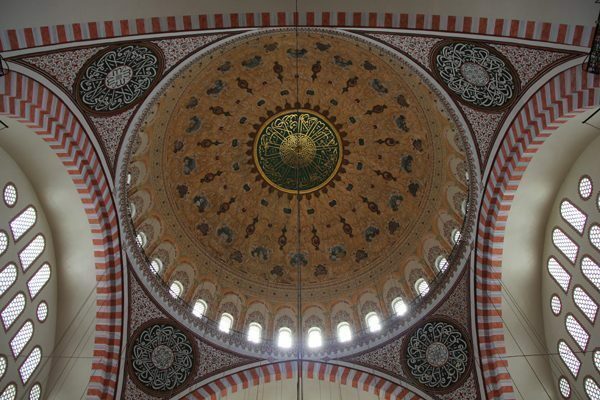 The flatter domes associated with Ottoman architecture. Another Ottoman trademark is the pencil-like minaret. We built them as tall and slim as possible. If you go to Cairo or any other countries with mosques from other cultures as well as Ottoman’s, you’ll recognize the Ottoman mosques in an instant, just by looking at our minarets. The number of minarets in a mosque was of great importance. Four minarets were only allowed on mosques endowed by a sultan, two minarets for princes and princesses, and one minaret for all others. 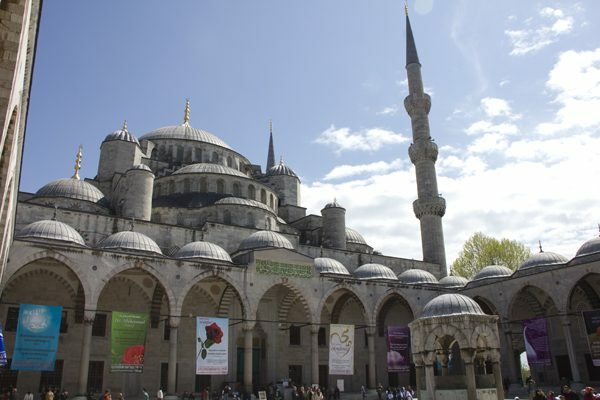 One exception though… Sultanahmet, or Blue Mosque, which has six minarets. 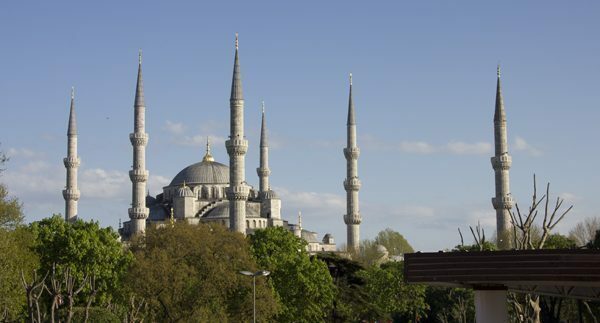 The six minarets of the Blue Mosque. It was essential for Muslims to see everyone in the mosque without any interruption (they wanted to know who was present or not). Based on this need of “full sight”, I would have mastered the technique of building vast inner spaces confined by seemingly weightless yet massive domes, and achieved perfect harmony between inner and outer spaces, as well as articulated light and shadow. This contrasts mosques in other cultures that have lots of columns. It looks silly that we hanged the oil lamps from very tall ceilings when they would be hanging so low. It was because of fire hazard. Carpets! Have you noticed how fancy our carpets are? The low hanging lamps inside the mosque. 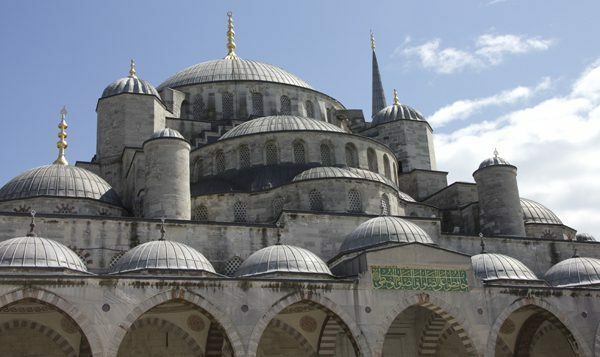 For almost 400 years, the Byzantine architectural characters of Hagia Sophia served as models for many of the Ottoman mosques, but we never copied Hagia Sophia – it is a one-time design. We liked to reuse materials, especially marble columns! Some times you can find mosques with Greek lettering or other pagan symbols, because that specific piece of material was previously used at another building. Me, and my peers, would have transformed the mosque from being a cramped and dark chamber with arabesque-covered walls into a sanctuary of aesthetic and technical balance, refined elegance and a hint of heavenly transcendence. The elegance behind the open space, the decoration, and the light. Even though we did all the things previously mentioned, sadly, architects didn’t matter much in Ottoman history and culture. Today, little is known about us or how far was the extent of our collaboration. 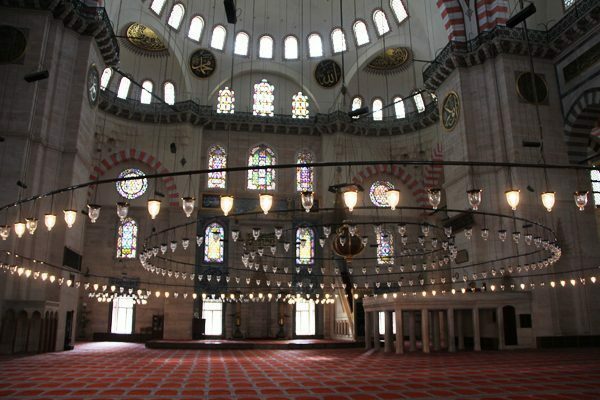 But, there is one architect that did manage to become famous – Mimar Sinan. He had a strong influenced in the development of Ottoman architecture. As a final note, I want to thank Max of Context Travel for giving me all the juicy details in our Ottoman Architecture Context walk. 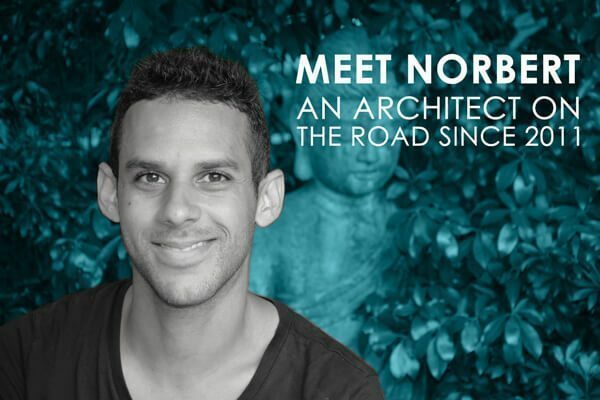 I really enjoyed reading your post, Norbert! 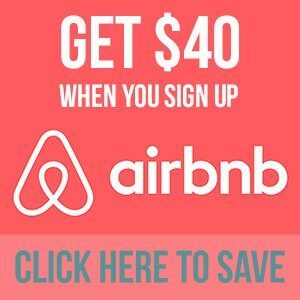 Thanks for sharing your write-up. I love it when you do these posts, because your passion for architecture really shines!